Sounds like Epic is *ahem* GEARING up for a fun Halloween. The Gears of War 2 "All Hallow's Eve" event begins Friday morning, and will likely keep you glued to your Xbox 360 all weekend. The fifth title update for the game is available today, fixing some bugs and exploits. This weekend, XP earned in competitive multiplayer (the tricks) and Horde mode (the treats) will be doubled, allowing you to earn those achievements and the respect of your peers just that much faster. Horde mode won't be the same ol' thing, though. How does "more Boomers" strike you? Beyond that though we wanted to mess with the waves in Horde to try and make it appropriately "scary" for Halloween. So while Butchers seemed on target for the theme, they didn't provide enough umph to make it scary. So we thought, what if any of the many Boomers could attack on any wave and when possible, a full Boomer squad consisting of Grinders, Butchers, Flame Boomers and regular Boomshot Boomers could appear and attack all at once. And of course waves 10, 20, 30, 40 and 50 would be nothing but wave after wave of Boomers. Sounds scary and fun to me! Making things even more difficult, Maulers are being removed. This means no more steady supply of shields to hold off the Boomers. Yeah, that's pretty scary! I'll be hearing "BOOM!" in my nightmares for weeks. The following fixes and improvements are included in Title Update 5. Adds the ability to view friendly-planted grenades in Tac/Com. Removes the cringe caused when a smoke grenade forces a player to drop a meatshield. Adds bonus points to the winning leader's score in the Guardian game mode if the leader successfully survives the winning round. Changes the postmatch Invite button to only invite former teammates, so a player can create parties more easily instead of trying to create a Private Match that includes both teams from the former match. 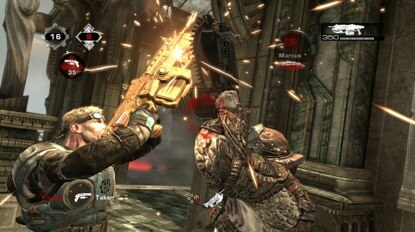 Returns the roadie-run camera movements to the way they were in Gears of War 1 by decreasing the dampening values. A player could modify the game's behavior due to a security vulnerability introduced in an earlier title update. A player could use a turbo controller to artificially maximize their rate of fire. A player could mantle a planted shield in competitive multiplayer to hide inside geometry or to travel outside of the map. The ability to mantle shields was removed in competitive multiplayer but remains in Horde and Campaign. Title Update 5 also fixes a number of other, lesser-known exploits. An issue that contributed to the "sticky walk" problem, where a player's avatar could stutter after the player picks up a weapon. An issue that could prevent players from hearing the "boom" telegraph from Boomers. An issue that could cause looping audio to continue playing after the player who triggered that sound is killed. An issue that could cause multiple names to be highlighted yellow on the scoreboard instead of the name of the player viewing the scoreboard. An issue that prevented the game from granting the earned experience points from the fiftieth wave of Horde. An issue that caused players at level 100 to see the "congratulations" message after every match. Title Update 5 also made additional small bug fixes. Page created in 0.3420 seconds.